Join the discussion on our forums! Come discuss Clockwork Automaton over in our dedicated Clockwork Automaton discussion topic. 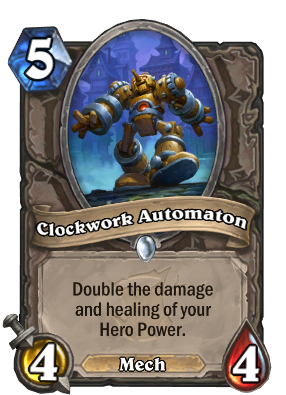 This will be discoverable by Dr Boom's Hero Power and will allow for a surprise 6-damage or 2-damage aoe at a later turn. Because Siphon Life passes through the Automaton twice. First it checks for Automaton, doubling the damage of Siphon Life to 6. Then, before any healing is applied, it checks for Automaton again, taking the healing (6) and doubling it (12). Priest with Prophet of Valen, two of these cards paired with the shadow card played twice that upgrade your hero power but makes you deal damage... I took a hit for around 16 damage just by his hero power. Considering how Velen and Spirit Lash worked together, I'm pretty confidant that Bloodreaver Gul'dan's Hero Pwer under this effect becomes a huge "deal 6, heal 12", since first it doubles the damage (3x2=6), then doubles the healing from the lifesteal ability (6x2=12). If the hero power was just "deal 3, heal 3", then it wouldn't work that way, but the lifesteal mechanic does the trick! Still, I'm not completely sure it will be added anyway, as when you drop the DK you are already in a fenomenal advantage and this card would just probably be a win more; recently Lock has gained a big amount of healing options too, so you don't even need much of another big heal. And before the DK, a 4/4 for 5 that doubles the lifetap damage is not really nice either. I played against this, op af. how about this + an Auchenai kind effect + Baku on the deck, does it deal 16 dmg? or only 8 dmg? If odd mage becomes viable this combines nicely with Baku the Mooneater. 4 dmg hero power, yes please. It might actually work out that way yes. Read the text on diamond spellstone again, that's not how it works. Damage and Healing only, So only Warlock, Mage, Priest, Hunter in the original heroes. Did not mention anything about armor, weapon, attack...etc.